Apple Crisp Without Oats, with a streusel topping that’s easy and quick to prepare and full of flavors from brown sugar and cinnamon. It’s perfect for a weeknight family dinner or a fancy dinner party—your family and friends will devour this Easy Apple Crisp! I will tell you a secret: I love oatmeal for breakfast. But. I detest oats in any type of dessert or pretty much anywhere that is not oatmeal for breakfast. So when making a fruit crisp I like to top it with a streusel topping without oats. Sometimes toasted nuts can be part of the streusel depending on who is going to eat it, but usually I opt for no nuts and no oats. The key is to make sure your apple crisp topping stays crispy and doesn’t get soggy, and there are several factors that affect the topping: the apples, the dish, and the ratio of topping ingredients. When choosing the best apples for apple crisp, you want to think about baking structure and liquid because some apples will get too mushy and ruin your dessert. 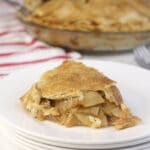 I like to use a mixture of Granny Smith apples and Golden Delicious apples, just like when making my Classic Apple Pie. There are plenty of other apple types that you can choose from, so just keep in mind that you want to choose apples that are good for baking and mix up sweet and tart for deeper flavor. You can also use pears or a combination of apples and pears in this apple crisp without oats recipe, and you can even throw in dried raisins or cranberries. Just be sure if you use pears that you use baking pears. 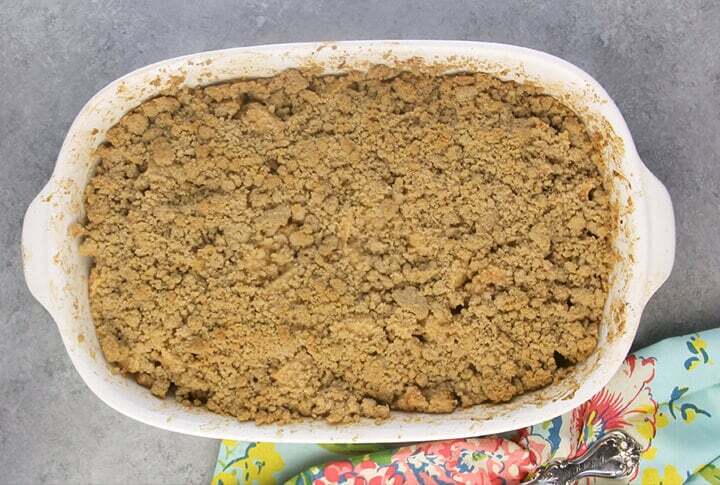 I like to use a shallow baking dish similar to this one when making this apple crisp. If you use a dish that’s too deep, there will be too much moisture and the apple crisp topping will get soggy. 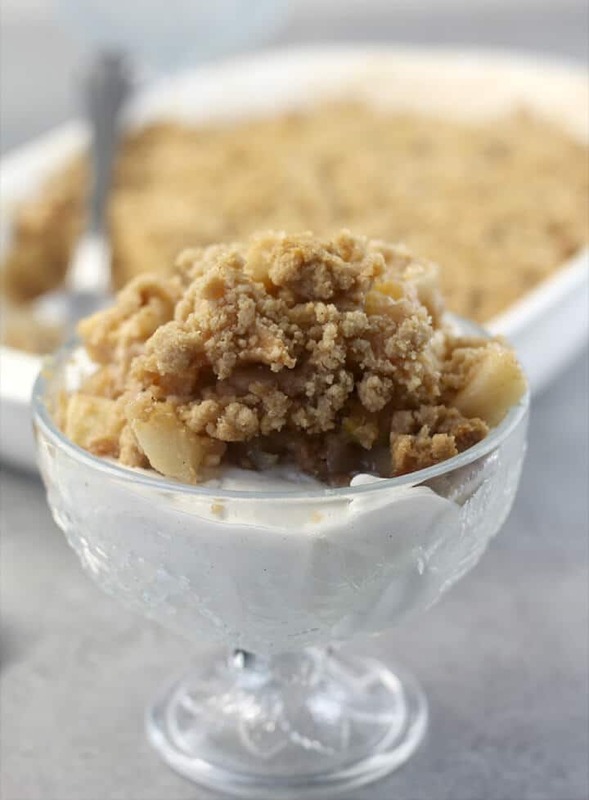 This Easy Apple Crisp is so simple you can make it for a quick dessert even during a busy week. 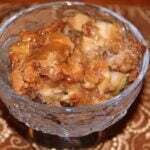 I peel the apples then chop them right into a buttered shallow casserole dish. Mine is a little smaller than a 9×13 dish. The size of the dish is important to help the topping stay crispy. If you squish everything into a smaller, deeper dish, the topping won’t be spread out and the liquid from the apples will be more likely to affect the texture of the apple crisp topping. You don’t need a lot of ingredients for this easy apple crisp and you probably have most of them in your pantry. Cinnamon and nutmeg – yum! You’re going to love how absolutely EASY this recipe is! Preheat oven to 375. Butter a medium-sized shallow casserole dish. **Cook’s Tip: Mine is a little smaller than a 9×13 dish. Peel apples and then chop into 1/2-inch pieces right into the buttered dish. Add the lemon juice to the apples and gently toss to coat the apples. Add the vanilla, cinnamon, brown sugar, and cornstarch and gently mix until distributed throughout the apples. Don’t you think the streusel topping is the most important part of any fruit crisp? Since I like my apple crisp without oats, I have to make sure there’s a lot of flavor from brown sugar, and a good bit of crunchiness—no soggy apple crisp topping please! Make sure you’re using cold butter. Stir together the flour, brown sugar, cinnamon, a little freshly grated nutmeg, and a pinch of salt. Mix well. Add the butter and use your hands to mix until a pebbly, crumbly mixture. Sprinkle about a third of the topping over the apples and move the apples around a bit so some of the topping is mixed in with the apples. Sprinkle remaining topping over the apples. Bake for 45-50 minutes until topping is golden brown. **Cook’s Tip: Keep an eye on it, as your oven might require less time–I have baked in 35 mins. Remove from oven and allow to rest for fifteen minutes. Serve with vanilla ice cream and caramel sauce. Bake the Apple Crisp for about 50 minutes or until the apple crisp topping is deep golden brown (just keep an eye on it, as your oven might require less time—I have baked this in 35 minutes in some ovens). Remove the dish from the oven and allow it to rest for fifteen minutes. So easy but so full of flavor! You can make this Easy Apple Crisp ahead of time also. Just put it together the day before you want to bake, but leave the topping off until you’re ready to bake. And of course, when serving you can add some vanilla ice cream and this amazing caramel sauce and then you’ll really wow somebody! Here’s a quick How-To video for the Easy Apple Crisp Recipe without Oats! An apple crisp without oats, with a streusel topping that's easy and quick to prepare and full of flavors from brown sugar and cinnamon. **If you want to use chopped toasted pecans or walnuts the topping, decrease the flour by 1/2 cup and use 1 cup of chopped nuts. Preheat oven to 375. Butter a medium-sized shallow casserole dish. Mine is a little smaller than a 9x13 dish. Peel apples and then chop into 1/2-inch pieces right into the buttered dish. Add the lemon juice to the apples and gently toss to coat the apples. Add the vanilla, cinnamon, brown sugar, and cornstarch and gently mix until distributed throughout the apples. Stir together the flour, 1 cup of brown sugar, 1/2 teaspoon cinnamon, a little freshly grated nutmeg, and a pinch of salt. Mix well. Add the butter and use your hands to mix until a pebbly, crumbly mixture. Bake for 45-50 minutes until topping is golden brown (just keep an eye on it, as your oven might require less time--I have baked in 35 mins). Remove from oven and allow to rest for fifteen minutes. Serve with vanilla ice cream and caramel sauce. 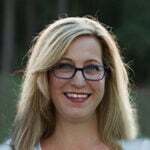 Update Notes: This post was originally published October 15, 2014, and on September 24, 2018, was updated with one or more of the following: step-by-step photos, video, updated recipe, new tips. 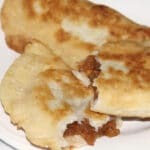 This post is part of Meal Plan Monday on SouthernPlate.com. Just made this. Soooo good!!!!! Whole family ate it up! Thank you! Merci pour cette recette parfaitement équilibrée au niveau des proportions. Un vrai délice 👌. Thank you so much for this easy recipe, all flavors are perfectly balanced. Delicious ! I made it tonight…..turned out absolutely beautiful…and soooo good….I will definitely make it again! This was fantastic with peaches! I used the nut variation (pecans) and thrilled with the results. Definitely will make again. Really delicious . Made it for desert tonight and topped it with icecream. Thank you for the amazing recipe! I bet this would be good to use with a few of the pears still hanging on our trees. Looks so good, I can almost smell it.